The Admiral Gaming Chair V2 by Spieltek is a racing-seat-inspired chair designed to provide you with comfort over long gaming sessions and multiple customization options. It features an extra-high backrest, a contoured shoulder area, and side bolsters to support and cushion your body. Constructed with an all-metal frame, the Admiral is sturdy and durable, capable of supporting up to 330 pounds. Furthermore, you can adjust its height, tilt angle, recline, and armrests to fit your body and how you sit. A lumbar pillow and headrest pillow are included with the Admiral for additional support and comfort. The Admiral has a racing-seat inspired design that offers contoured support for your body with its high backrest, shoulder support, and padded sides for all-day comfort. Wrapped in a leatherette material covering with a carbon fiber print, the Admiral provides you with a soft, textured feel and a stylish design. Keep your head and back supported with the included lumbar and headrest pillows for a more natural and comfortable experience. Adjust the height and tilt angle to accommodate your body and sitting position. There's also a tilt-lock lever to keep the chair stationary even while tilted back. The back of the seat can also recline almost all the way back should you want to take a nap. Whether you're sitting upright or reclining, the armrests can be adjusted up and down, forwards and backwards, in and out, and rotated laterally to fit your play-style. Large 3" casters allow for smooth rolling over hardwood and carpeted floors. Constructed with an all-metal frame that supports up to 330 pounds, the Admiral is sturdy and durable. The frame is also backed by a lifetime warranty. Box Dimensions (LxWxH) 37.0 x 28.0 x 17.0"
Admiral Gaming Chair V2 (Black/Red) is rated 5.0 out of 5 by 2. 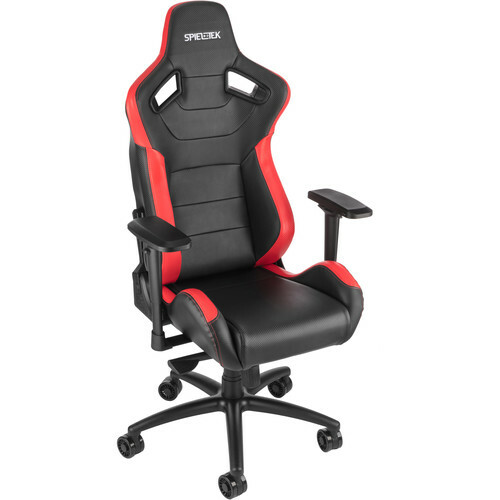 Rated 5 out of 5 by Sun Kyong from The best and cheap gaming chair! I set this chair at B&H and it's really comfortable and fine. It's $250 but other gaming chairs will cost much more. The quality of this gaming chair is already high enough to satisfy. It was the first time spending tons of money on the chair and I didn't?regret it. You can add or remove two cushions of your choice. One thing that I don't like is that adding a mid-cushion?is quite hard and inconvenient. Besides that, no issues at all. Well, you can try this chair at B&H first to decide. There are other two chairs. The cheapest one is nice but I dont like the quality of its cushions. Second cheapest is also fine but I preferred?this one.